South Park is one of those shows that I’m surprised has lasted this long, it is arguably the most offensive TV show out there. They’ve decided to venture into the video game world once more and this time all hands are on deck. Trey Parker and Matt Stone, the creators, vowed to get actively involved to make it the most authentic adaptation possible. 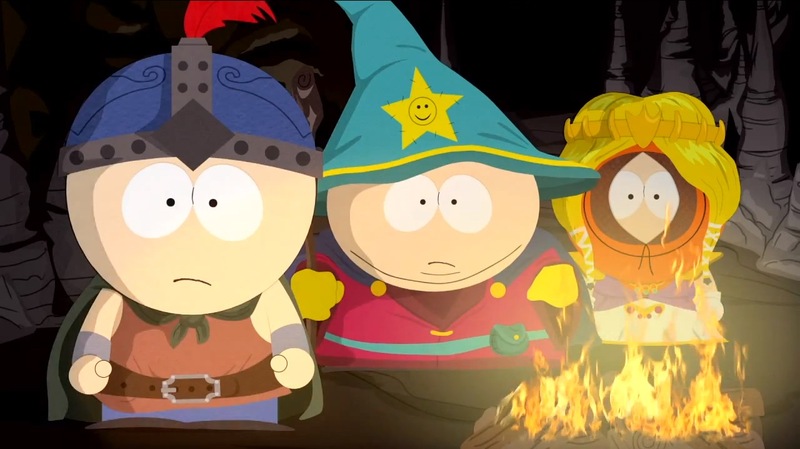 Stand aside Chef’s Luv Shack and Tower Defense because here lies the newest title, determined to blow away all their previous efforts, South Park – The Stick of Truth. Set out as a Role-Playing adventure, you become the new kid in town and you’ve couldn’t have arrived at a worse time. The battle between humans and elves has reached breaking point where their respective leaders are laying all their hopes on you. What caused such a war between these races? 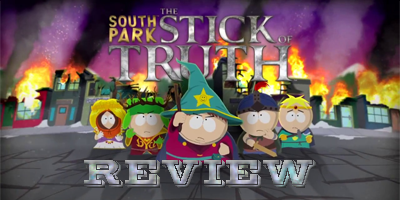 The possession of the ultimate weapon to take control of the Universe, the Stick of Truth! Unfortunately all is not as simple as it seems as a selection of other factions and enemies threaten the whole survival of the quiet little mountain town we know as South Park. Once you’ve created your character, using the decent amount of customisable hair and features on offer, you are thrust into South Park and seem a perfect fit in a 2D world in the style of the show itself. As it is an RPG you can choose which class you’d prefer to be, I went for “Warrior” for a brutish fighter but there’s also “Mage”, “Thief” and that obviously frequently seen class… “Jew”. Already I knew that was hardly scratching the surface of how far they will go in an attempt to offend the masses. During the tutorial you are taught that combat during battles is true to its genre in such way that each character takes a turn and choose what to do on this turn is up to you. Options include melee, range, magic (not the conventional kind), special moves and using items. I rather enjoyed combat throughout because it’s more interactive than I’m used to; connecting with powerful hits relies on button press timings and the same goes when defending, timing is everything which keeps the player on their toes. I have to give credit to the range of weapons and armour for both the way they are used and the creativity put into them. Fight your battles with a dodge ball or a few lawn darts whilst dressed as an elven gothic doctor with wizard beard. There are loads of possible combinations to consider if you want to stand out from the crowd. If you remember that “magic” I mentioned earlier, well this is useful in battle and free-roam should you wish to blow away your enemies. Like a ninja you too could be silent and deadly once you’ve mastered the art of… farting. There’s only one rule which I cannot speak of, other than that you can fart to distract enemies, gross them out and even destroy things. Come on did you expect anything else? When you aren’t fighting you’ll be roaming around the entire town of South Park which seems large at first but soon becomes roughly a minute worth of journey time. Size isn’t everything though as the quests keep you busy no matter if it’s a main story quest to help recruit to your army or a side quest to find out which one of the girls’ group is a two-faced liar. 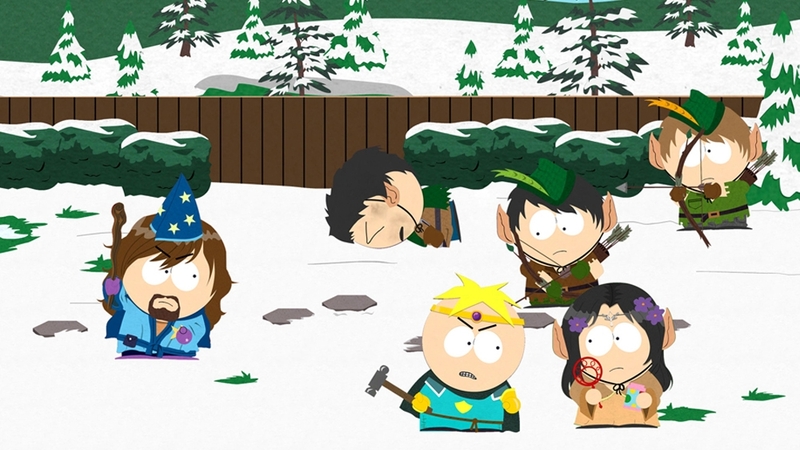 There are another couple of areas outside of South Park, one of which is especially pleasing to see as it pays homage to an RPG that most people love. Along the way there are many collectibles to look out for, with friends being a high priority in a simplistic Facebook style concept. The navigation menu between inventories and maps has an “old school” PC feel to it which takes a little adapting to. Keeping an eye out for Chinpokomon (parody of those beloved Pokémon creatures) ensures that no stone is left unturned and garages are ransacked. Looting gave me a few laughs that I never expected, be aware searching through peoples drawers can lead to unsavoury items and playthings, that’s as detailed as I can go. The strongest area of the game is the story no doubt; the cut scenes give it an interactive feature length episode feel and you are always the main focus. Working to their strengths they incorporate every character imaginable, not just Stan, Kyle, Cartman and Kenny but even some old favourites that you think “Nah they’ll not be in it”. Idea-wise it’s outrageous and beyond the line of morality to the point where parts have actually been censored in the European edition. Luckily the censored parts are a minority and it doesn’t make too much difference. Whilst it stays relatively true to the nature of role-playing games it doesn’t have the vast environment normally seen. What it does have it makes the most of, squeezing every last drop from jokes and making fun of everyone along the way. You can tell the creators have heavily influenced the game because it has turned out to be nearly everything a fan could ask for. 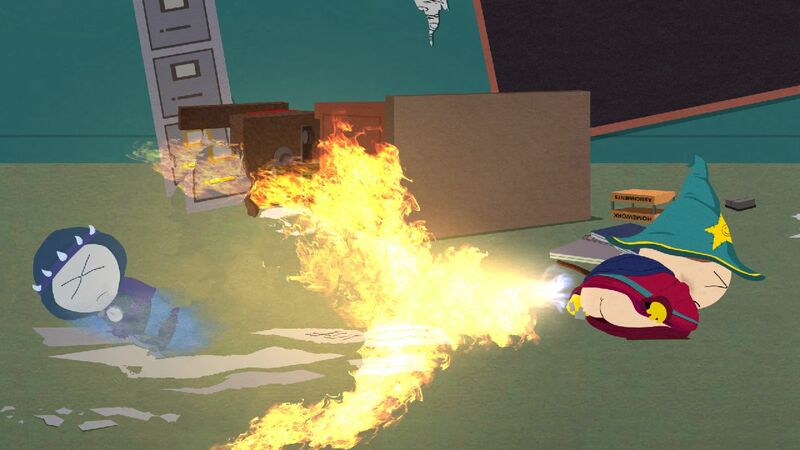 South Park – The Stick of Truth is an 18 rated title so if you wish to buy it be prepared for swearing, violence and adult humour. Previous articleLife is better with a Titan. New Titanfall trailer released.